The Westinghouse SMR has just been announced. It is about 50% larger than the Babcock & Wilcox 125 MW SMR the mPower. Like B&W, Westinghouse is keeping a lot of the details of its SMR secret. One reason for that could be that neither reactor has been designed yet. Westinghouse was, about a decade ago involved in an earlier SMR concept, the IRIS. The IRIS was substantially larger than the current Westinghouse SMR concept. My comparison of what is known about the SMR design and the IRIS suggests that the SMR design differs considerably from the IRIS design, and is considerably more compact. The IRIS was not designed as a small set of rail transportable modules, and was considerably more bulky. The general layout of the SMR is suggests that its design was not influenced by the IRIS but there are some to be some similarities between the Westinghouse SMR and the announced design scheme of the B&W mPower. This may not be entirely an accident. I can imagine some Westinghouse design engineer looking at a drawing of the mPower design and concluding that he could do a better job than the B&W design engineers. Neither Westinghouse nor B&W have published much data on their designs. As I have indicated that is probably because the detailed design work has not started yet. 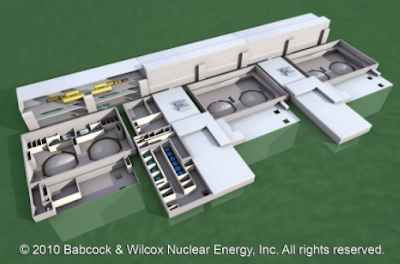 The current Westinghouse concept appears to envision truck or rail transportation of factory built modular parts to the reactor building site, with final field assembly. Both the B&W and the Westinghouse design concepts appear to envision a couple of years of field assembly, with several million person hours of assembly work being conducted on site. Westinghouse may well have some assembly cost advantages due to a superior economies of scale. Both reactor concepts envision a below grade reactor housing, thus eliminating the massive reactor containment vessel of larger reactors. Underground housing should shut up once and imaginative anti-nuclear critics like Karl Grossman, who imagine terrorists crashing Boeing 747s into nuclear plant containment structures and killing millions of people. Drawings of proposed mPower design schemes suggest that only the reactor itself is intended to be below grade, while the turbine and generator is above ground. Although little is know about either mPower or SMR designs, it would aopear that Westinghouse is envisioning a smaller foot print for their larger reactor. The mPower offers customers a choice between air and water cooled mPower options, and this customer choice will influence above grade facility design, although B&W has not hinted yet about how think the air cooled mPower will look. B&W envisions a six-pack reactor design, with a long narrow turbine hall running to the rear of a row of 6 reactors. The circular objects are the tops of the outer containment chamber. Westinghouse thinking may place the SMR deeper underground, but more has to be revealed, befor we can be certain. I suspect that the Westinghouse SMR announcement was greeted with considerable interest in Lynchburg, and perhaps some consternation. B&W may want to rethink mPower electrical output, especially if they think that Westinghouse can build a 200 MW reactor for a cost that is close to the cost of the 125 MW mPower. Finally we have to consider what this means for Molten Salt Reactor prospects. What appears to be happening is that the once morbid American Nuclear Power Industry appears to have, at last woken up, and innovate in their design. Factory building mens larger scale production, and if you cn produce parts for 100 reactors in a year, you want to sell them. If your competitiopn is also producing parts for 100 reactors then you have the potential for price competition. One war to make a profit with competition driven low prices, is to adopt cost lowering innovation, and the MSR offers outstanding cost lowering potential. 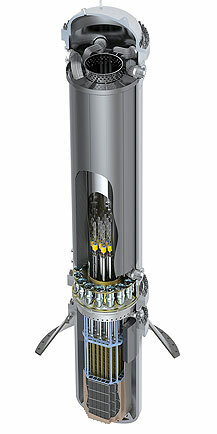 So the Westinghouse SMR is a step toward the emergence of an American MSR. Are Loan Guarantee's eligble for this kind of R&D? No, not as far as i know. I think the small modular game could be very interesting. But, putting it in the context of the cross-post from NNadir above, I am more interested in seeing 10-2 GW LFTR's in a plant just outside of Mexico City, supplying it's 20 million inhabitants with all the energy they need for a 'reasonable' lifestyle. That is the kind of major development we are going to need to head off trouble. This is great news both for SMRs and for the nuclear renaissance. Having two major players in the SMR market will give confidence to investors, customer, and the NRC that the market is real. It will help build momentum. It will also make it more politically feasible to deploy LFTRs on the pure thorium cycle. Practically speaking, to sell LFTRs, the US must also have an attractive & modern LEU burner for export to "non-fuel cycle countries".